We did our annual day trip to Skegness yesterday. It's mandatory for most people in Nottingham and the East Midlands. When I say annual trip, we sometimes go twice a year ! We walked about 11 miles along the coast (5.5 miles each direction) and took a picnic. The temp was about 8C. I took some pics too. This is the view from the esplanade as we make our way back to Skegness. I'd say our walk was 50per cent beach and 50 per cent coastal path. I thought about cloning out the seagulls in the foreground as they are a little blown out as well as being blown about ! 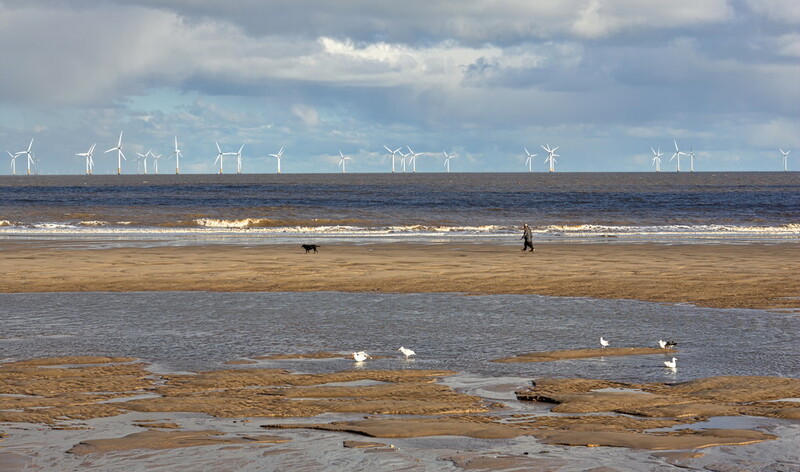 Lovely photo Phil, we do love a breezy walk along the sea shore! These wind turbines are very near...we have them on our coast line too but way out on the horizon. Hope Ruby had her coat on! Firstly I am impressed by 11 miles. Secondly I like wind turbines. Thirdly I love the soft colours. I think this is a great beside-the-seaside photo - fav. Why have I never been to Skeggy. Being a Scouser by birth, it's probably just a bit too far! Looks good and wild though. I'm glad you didn't clone out the gulls; it's nice to see them enjoying the water. Love the pov and the layers in this shot; yes like wind turbines also. They are sleek and beautiful. I'd rather them than open-cut coal mines any day. As in your country, there is a divergence of opinion here as well. I drove through a big wind farm recently and kept stopping to take pictures. Fav. for this delightful shot. Pity the wind turbines spoil a bit the view but I guess they are very necessary nowadays. Otherwise a wonderful capture of the view. You had a healthy walk, well done. No walk for me today - been raining all morning. Gulls are a bit of a pain when it comes to trying to get a good exposure but I think they balance the details in the composition. It's a lovely scene and capture. Just wish I could be there; I love the coast. It's nice to see this lovely seascape of your country, always interesting for me to see what it's like where others live. Glad you left the gulls in. @quietpurplehaze thanks for the three likes and fave haze .Nottingham is 70+ miles from the coast on relatively poor roads , over 2 hours drive . I have never lived more than 12 miles from the coast. And funnily enough, when I go on holiday I always want to be beside the sea.